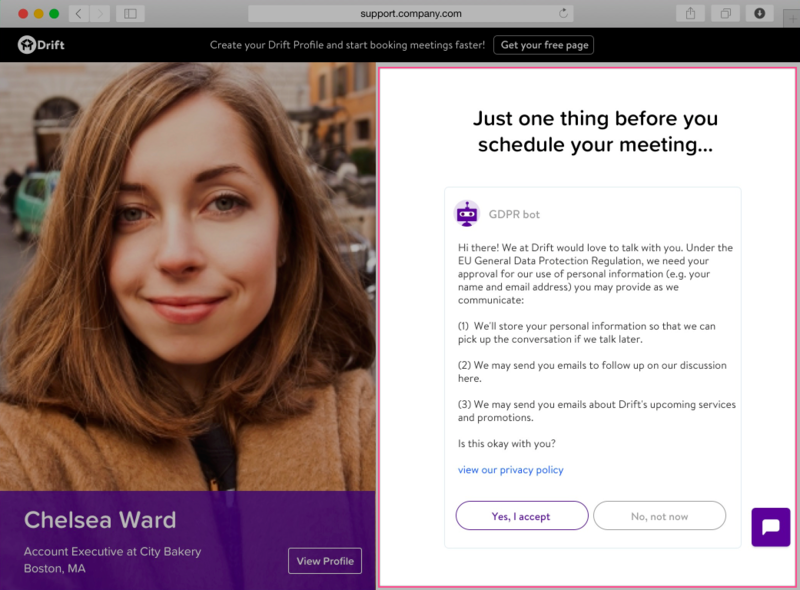 For GDPR compliance, end-users may need to give consent for Drift to save their information. In this article, we'll cover how to create consent forms for your customers and what it'll look like. 1. Create a consent form, as outlined below in the article. 2. This consent form will appear users who's "has_consent" attribute is empty. 3. Email users with a link to any driftlink playbook. The form will automatically show and ask for consent from the user. Start by going to Settings > Data Privacy. Here's what you'll see and what each section means. You can also customize messaging after the user opts out. If you have multiple forms setup for different languages, the end-user will see the one matching their browser language (if any exist) and the default otherwise. How do I know which customers have given consent? Navigate to Settings > Data Privacy and view the Consent API section. Here you’ll find the Drift Attribute associated with consent. Whenever a customer consents via Chat or Email, we’ll set this attribute to true on their contact record. Drift uses this attribute to determine whether returning customers should be prompted for consent. If you change the Drift Attribute to which consent is associated, customers who previously consented may be prompted for consent again unless this attribute is true on their contact record. You may track which customers have consented by creating a Dynamic Segment based on the Drift Attribute associated with consent. Collecting consent outside of Drift? Admins in Drift have the ability to retrieve or delete end-user data. You can do this in Settings > Data Privacy. You can also do this using our API.